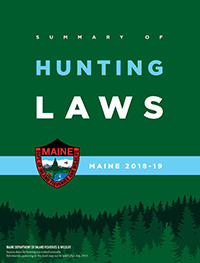 Legal hunting hours are based on sunrise/sunset in Bangor, Maine (Eastern Standard Time). Coyote: Daytime hunting hours, see chart above. Hunting coyote during the coyote night hunting season (December 16 to August 31) is legal from 1/2 hour after sunset to 1/2 hour before sunrise, and shall cease at midnight each Saturday and resume at 12:01 AM on Monday. Raccoon: Daytime hunting hours, see chart above. Hunting raccoon at night is legal from 1/2 hour after sunset to 1/2 hour before sunrise, and shall cease at midnight each Saturday and resume at 12:01 AM on Monday).